MEXICO (REUTERS, AFP) - A powerful earthquake struck off the southern coast of Mexico late on Thursday (Sept 7), the United States Geological Survey (USGS) said, killing at least six people, triggering small tsunami waves but causing no major destruction. The USGS put the quake's magnitude at 8.1. 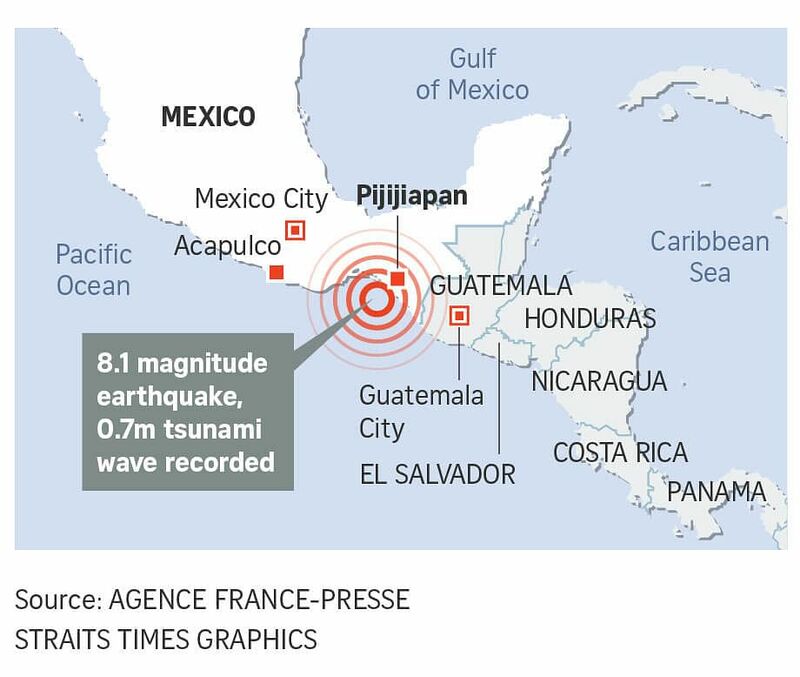 It said the epicentre was 123km south-west of the town of Pijijiapan, in the southern state of Chiapas, at a revised depth of 69km. Mexican President Enrique Pena Nieto said the magnitude was 8.2, the strongest in a century in the country, AP reported. The quake was also stronger than a devastating 1985 tremor that flattened swathes of Mexico City and killed thousands, but initial reports of damage in the city were limited. Waves as high as 0.7m were triggered in Mexico, the Pacific Tsunami Warning Centre (PWTC) said. Widespread, hazardous tsunami waves were possible within three hours, it added. "Based on all available data... widespread hazardous tsunami waves are forecast for some coasts," the PWTC said earlier. "Tsunami waves reaching more than 3m above the tide level are possible along the coasts of Mexico," it said, with lower waves in other countries. "The tsunami risk on the Chiapas coast does not represent a major risk, it's not very big, it's not a major worry," Nieto said in a call to TV network Televisa. The president said more aftershocks were likely and that people should carefully check their homes and offices for structural damage and for gas leaks. "We are alert," he said. As far as 14,000km away in the Philippines, the national disaster agency put the country's entire eastern seaboard on alert for a possible tsunami. No forced evacuation was ordered, but residents were told to monitor emergency radio broadcasts. However, there was no tsunami threat for the American Samoa and Hawaii, according to the US Tsunami Warning System. Four people were killed in the state, Governor Manuel Velasco said. Two children were killed in neighbouring Tabasco state, Governor Arturo Nunez said. A number of buildings suffered severe damage in parts of southern Mexico. Some of the worst initial reports came from Juchitan in Oaxaca state, where sections of the town hall, a hotel, a bar and other buildings were reduced to rubble. Windows were broken at Mexico City airport and power went out in several neighbourhoods of the capital. Rescue workers laboured through the night in badly affected areas to check for people trapped in collapsed buildings. People in the capital, one of the world's largest cities, ran out into the streets in pyjamas as alarms sounded after the quake struck just before midnight, a Reuters witness said. In one central neighbourhood, dozens of people stood outside after the quake, some wrapped in blankets against the cool night air. Children were crying. Liliana Villa, 35, was in her apartment when the earthquake struck and she fled to the street in her pyjamas. "It felt horrible, and I thought, 'this is going to fall'." President Nieto ordered schools to remain closed Friday in Chiapas and Mexico City so officials could inspect for structural damage. He said on Twitter he was overseeing the emergency response from the National Disaster Prevention Centre's headquarters. The quake also shook buildings as far away as Guatemala. USGS reported six aftershocks, ranging in magnitude from 4.5 to 5.7. State oil company Pemex said it was still checking for damage at its installations, which include the Salina Cruz refinery in the same region as the epicentre. "I had never been anywhere where the earth moved so much. At first I laughed, but when the lights went out I didn't know what to do. I nearly fell over," said Luis Carlos Briceno, an architect, 31, who was visiting Mexico City. This is from an office in Mexico City hit by the 8.4 earthquake.